I’ve missed a few Mix-Ability challenges over at Splitcoast and wanted to try another one today. It’s all about ripping, pasting and inking designer papers. And, I’ve used the MOJO 286 sketch. You’ll find the links below if you’d like to play along. Fabulous background and colors Lee-Anne! Love the button and layout! 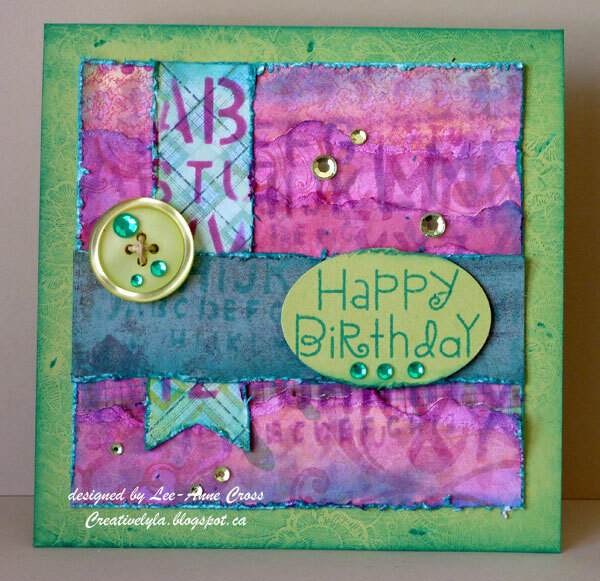 Mixed media intimidates the daylights out me….you just made it look easy! Just wondering with google reader going away what you are going to switch too? I seem to miss so much when I go away for awhile!! Great card!! Wowzers! All this talent floating in cardville. PS-I have blog candy. I'm giving away a $25 Etsy Gift Certificate.